Ernie Ringler, an employee at Grace College and Seminary for 26 years, has died. He was an member of the grounds crew and drove the bus for athletic events and student activities for 18 of those years. His obituary appears below. 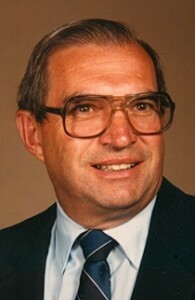 Ernest Alton Ringler, 83, formerly of Warsaw, Ind., passed away on Wednesday, Jan. 8, 2014, at Apostolic Christian Home in Rittman, Ohio. He was born on Jan. 30, 1930, in Johnstown, Pa., to Harry Daniel Ringler and Ida Florence (Aultz) Ringler. On Sept. 18, 1949, he was married to Mary Louise (Moeller) Ringler, who survives in Rittman. He had worked as a machinist and maintenance worker. He worked for 11 years at Bethlehem Steel Company in Johnstown, Pa.; worked for six years at Allis Chalmers and Navel Ordinance Plant in York, Pa.; and then he worked for 26 years at Grace College and Seminary in Winona Lake, Ind., as the grounds keeper and as a bus driver for most activities for 18 years. Ernest was a member of Lakeland Grace Brethren Church of Warsaw. He is survived by his two sons: Donald E. Ringler, Michigan City, Mich.; Timothy W. (Deb) Ringler, Mansfield, Ohio; four grandchildren: five great-grandchildren; and two sisters: Violet Moeller, Elkhart, Ind. ; Mary Thompson, Bellflower, Calif. He was preceded in death by his parents; a daughter: Sheryl Ringler; three brothers; and six sisters. His memorial service will be conducted at 11 a.m. Tuesday, Jan. 14, at Lakeland Grace Brethren Church, 2538 S. County Farm Road, Warsaw, and will be officiated by Pastor Dr. Russell E. Simpson. A private graveside service will take place at Oakwood Cemetery of Warsaw. Arrangements are entrusted to Redpath-Fruth Funeral Home, 225 Argonne Rd., Warsaw. Memorial contributions may be directed to Lakeland Grace Brethren Church, 2538 S. County Farm Road, Warsaw, IN 46580 and would be appreciated by his family.